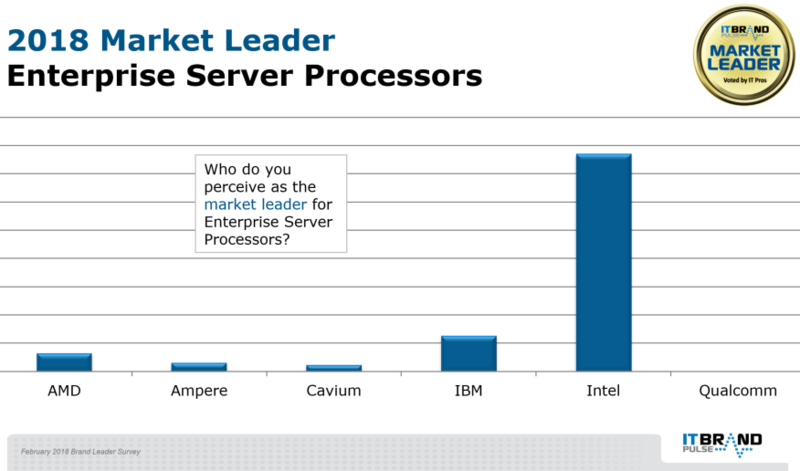 Intel pulled in a seventh consecutive Market Leader title; replaying the past two years of garnering nearly an 80% share of votes for Enterprise Server Processors. 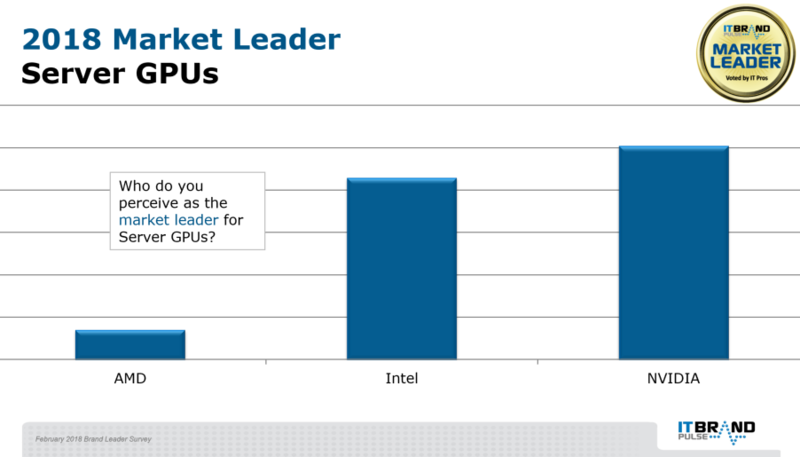 Intel’s Xeon also picked up Performance, Reliability, Service & Support, and Innovation, while tying with AMD for Price. Like last time, IBM Power and AMD Opteron, followed from a distance in the second and third Market Leader positions, accordingly. 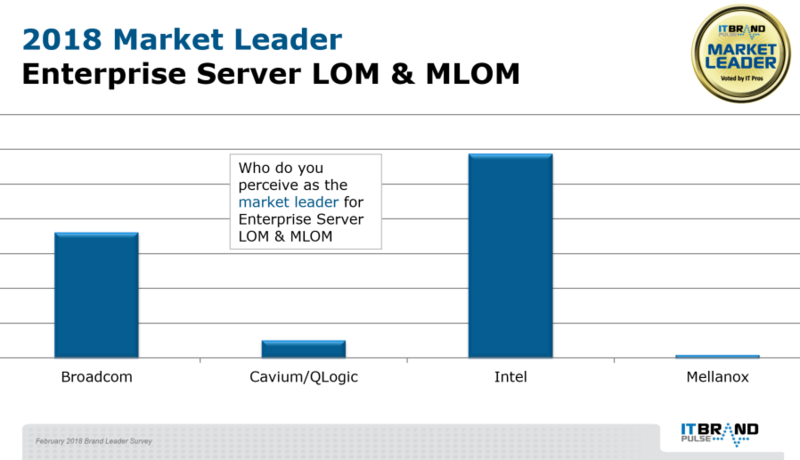 In a less-lopsided victory than in the Server Processor category, Intel was selected as Enterprise Server LOM & MLOM Market Leader (fifth year in a row), as well as for Innovation, Performance, Reliability, Service & Support, and Price. 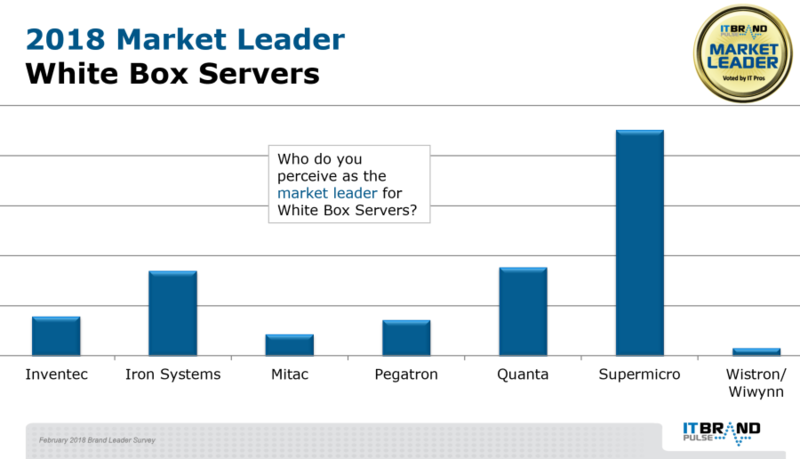 Next, in order, for Market Leader were Broadcom, Cavium/QLogic and Mellanox. From a group loaded with 11 vendor choices, respondents to the Integrated Systems survey duplicated results from 2016 and 2017 by favoring Cisco for yet another year as Market, Performance, Reliability, and Innovation leader, and this time around, adding Service & Support. Dell EMC was singled out for the Price award, and rounded out the number two Market position, with HPE/SimpliVity in third. 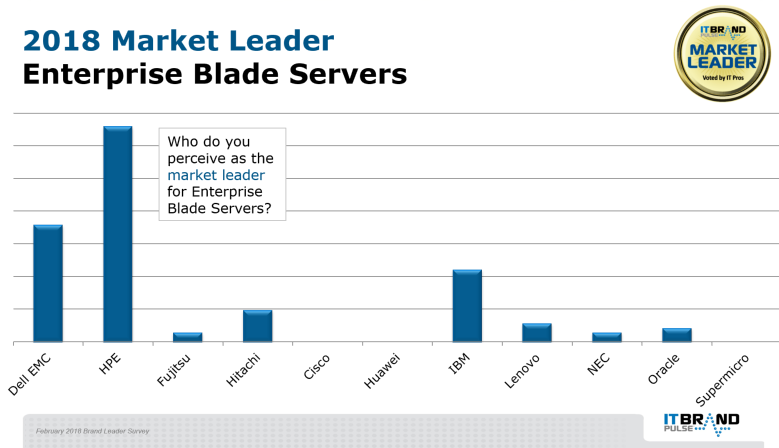 HPE remains the Enterprise Blade Server Market Leader—for the eighth time—in the minds of IT professionals, and went on to collect the 2018 Performance, Reliability, Service & Support, and Innovation honors as well. Though Dell EMC was voted Price Leader, Cisco edged them out to take the second Market spot. 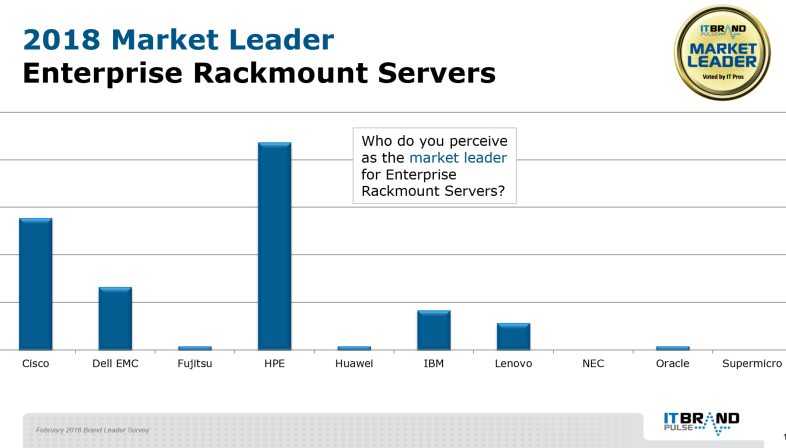 HPE reclaimed the Market Leader designation for Enterprise Rackmount Servers (taken by Dell EMC in 2016 & 2017), making it their fourth time in six years of this product survey. 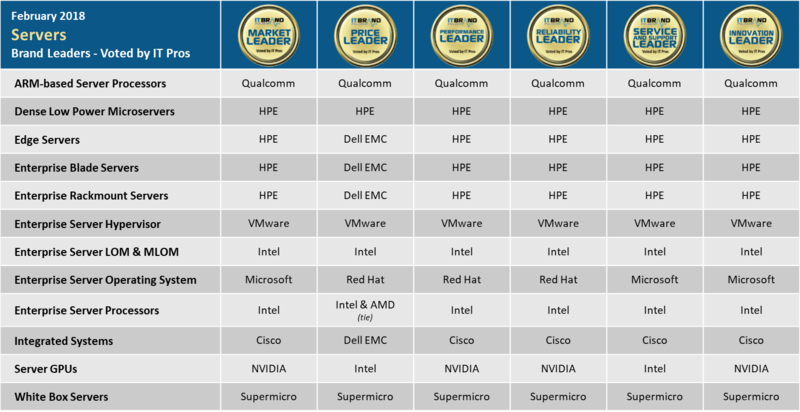 Voters included Performance, Reliability, Service & Support, and Innovation Leader titles to HPE’s win column for 2018, but saved Price for Dell EMC. Cisco made its way into runner-up Market Leader, ahead of Dell EMC. With the debut of this category in the brand leader surveys, HPE extended its Server accolades by securing Market, Performance, Reliability, Service & Support and Innovation leadership. 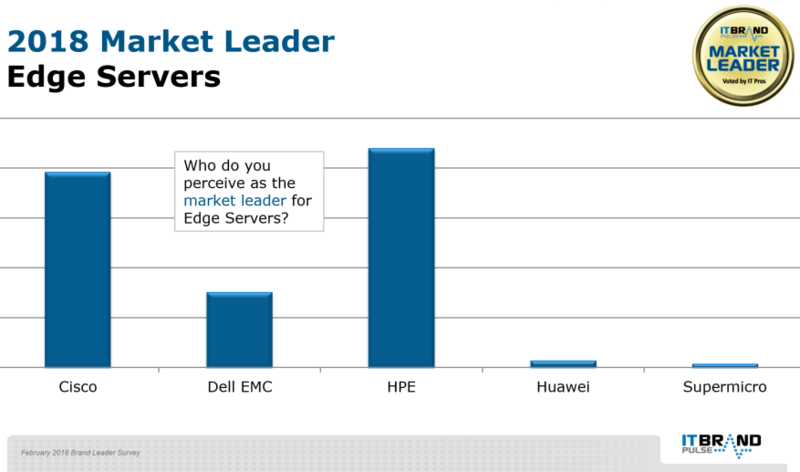 Dell EMC kept HPE just short of an Edge Server sweep by being named Price Leader but stayed third in line, behind Cisco, for Market. HPE’s Moonshot earned its fourth straight Market Leader achievement, while capturing all other available awards for Dense Low Power Microservers – Price, Performance, Reliability, Service & Support, and Innovation. 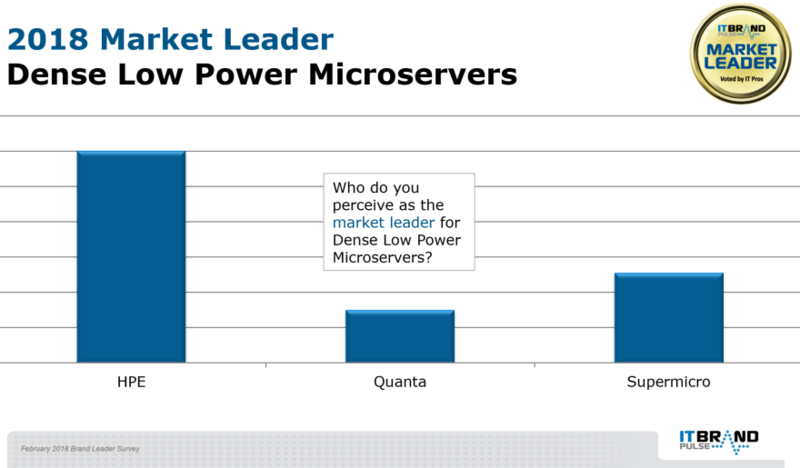 Comparable to last year’s results, Supermicro was number two all-around, in front of Quanta. 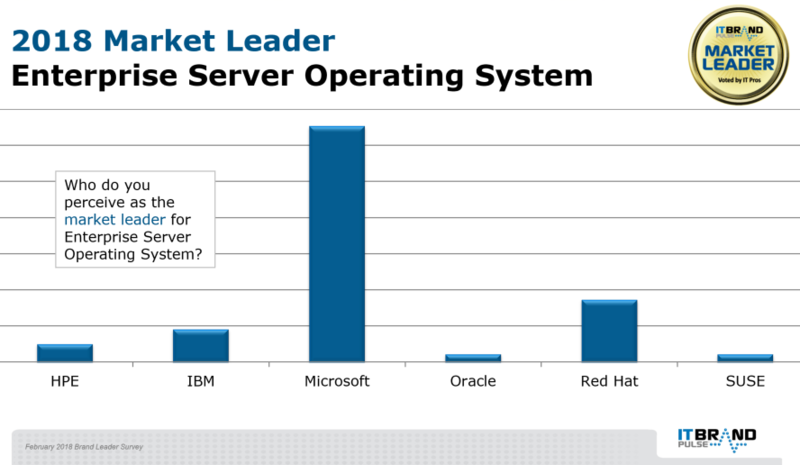 Microsoft nabbed the Market Leader title for Enterprise Server OS for the sixth straight year. While the IT pro community also cast their ballots for Microsoft Windows as both Innovation and Service & Support Leader, they split up the brand honors for this category by handing Price, Performance, and Reliability to Red Hat’s Linux (second place Market Leader; IBM AIX was third). NVIDIA outpaced its Server GPU rivals for the second year in a row and collected Market, Performance, Reliability, and Innovation leadership. Intel took Price and Service & Support while maintaining their Market runner-up slot, with AMD next. For the second time in as many surveys, Qualcomm Centriq seized over 60% of the Market Leader votes for ARM-based Server Processors and swept all remaining titles: Innovation, Performance, Reliability, Service & Support and Price. 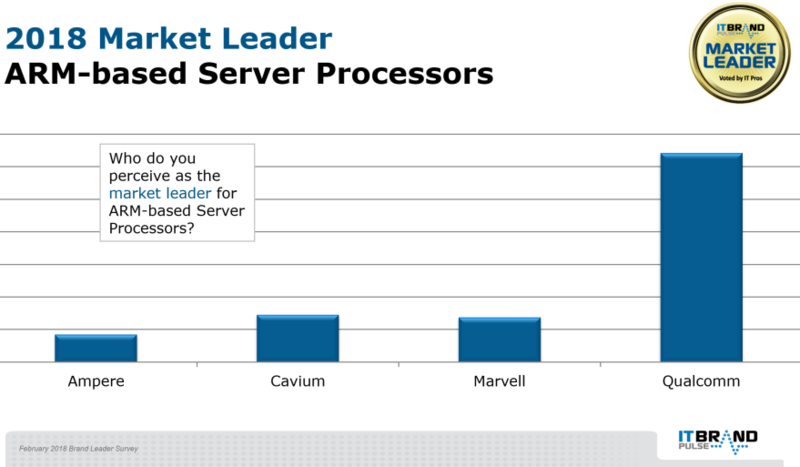 Cavium ThunderX and Marvell Armada, turned in number two and three Market Leader finishes, respectively. 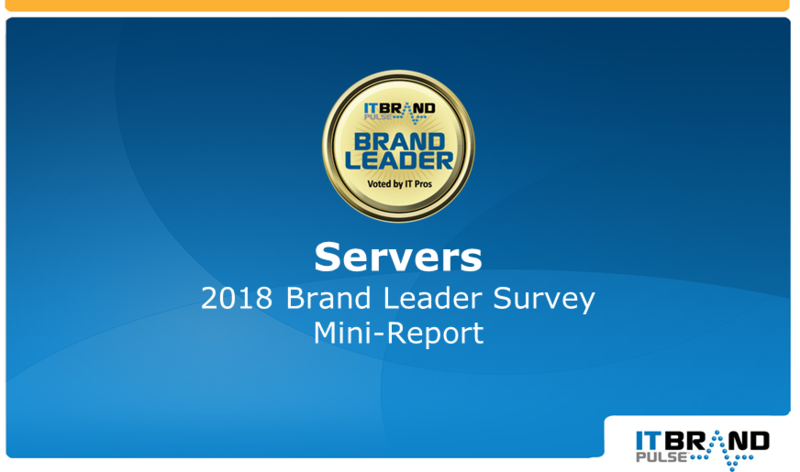 Emerging from last year’s second place, Supermicro jumped to the top of the White Box Server charts as Market, Innovation, Performance, Reliability, Service & Support, and Price leader. Quanta and Iron Systems filled in the second and third Market posts. 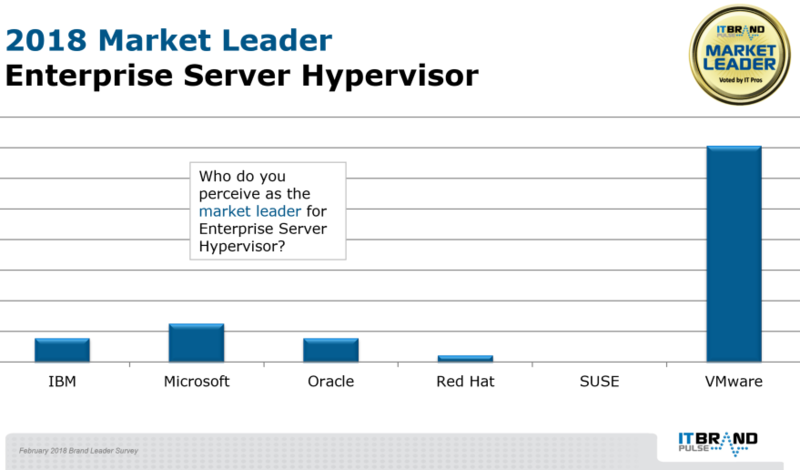 VMware dominated Enterprise Server Hypervisor, once again, by broadening the win column to seven years in every leader category: Market, Innovation, Performance, Reliability, Service & Support, and Price. 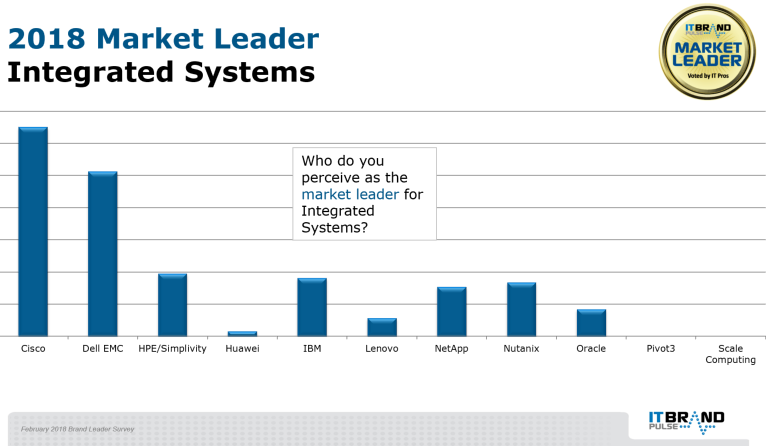 Microsoft secured second place Market Leader, with Oracle and IBM splitting honors for third. Global IT Pro respondents to recent surveys include: Alliant Energy – Allergan – Allstate Insurance – American National Insurance Company – Amkor Technology – Baird – BC Hydro – Big Lots Stores – Bloomberg – Boeing – BorgWarner – Boston University – BWAY Corp – Brinker International – British Airways – Caesars Entertainment – Canadian Imperial Bank of Commerce – Cardinal Health – CareFirst – CBRE – CBS – Celanese Corp – Chanel – Cirque du Soleil – CIT Group – Colliers – Compass Minerals – Covéa Insurance – CPS Energy – Cox Enterprises – CSL Behring – CSS Industries – CUNA Mutual Group – DaVita – Delta Airlines – Delta Dental – DHL – Dignity Health – Dish Network – DLL Group – Eaton Vance – Encore Capital Group – Ensco – ExxonMobil – Ernst & Young – EverBank – Federal-Mogul – Flagstar Bank – First Acceptance Corporation – Foley & Lardner – Forest City Enterprises – Fox Studios – Fresenius – H. B. Fuller Company – Henry Schein – Herman Miller – HOK – Hess Corp – Hyatt Hotels Corporation – Jet Aviation – Johnson Controls – Kellogg – Konica Minolta Business Solutions – Lockheed Martin – Macy’s – McCarthy Holdings, Inc. – Mentor Graphics – MGM Studios – Mohawk Industries – Molina Health – Moneris – Morningstar – MSC Industrial Direct – MTA – M&T Bank – National Oilwell Varco – Navigant – Navistar International – Ohio State University – Optum – Orlando Utilities Commission – Parker Hannifin – Pernod Ricard – Philadelphia Gas Works – Pitney Bowes – Polycom – PPG Industries – Quicken Loans – Raytheon – Reliance Steel & Aluminum Co. – Rich Products – Sherwin-Williams – Siemens Corp. – Spectrum Brands – Steelcase Inc. – Structure Tone – Stryker Corporation – Sun Life Financial – Sysco – Tailored Brands – TE Connectivity – The Hanover Insurance Group – TD Ameritrade – Thomson Reuters – Time Warner – Transamerica – Veolia – Verizon – Volvo Group – Wawanesa – Wellington Management Company – World Vision International – Xylem Inc. – Yale University – Yazaki…and many more.